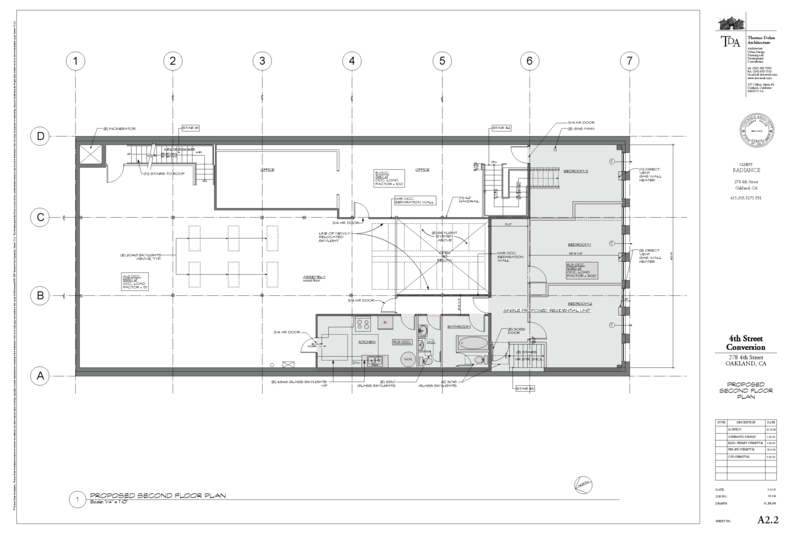 As outlined in the plan cover page below, the building is currently set up for residential use and as an art gallery for a total of 8,620 square feet. 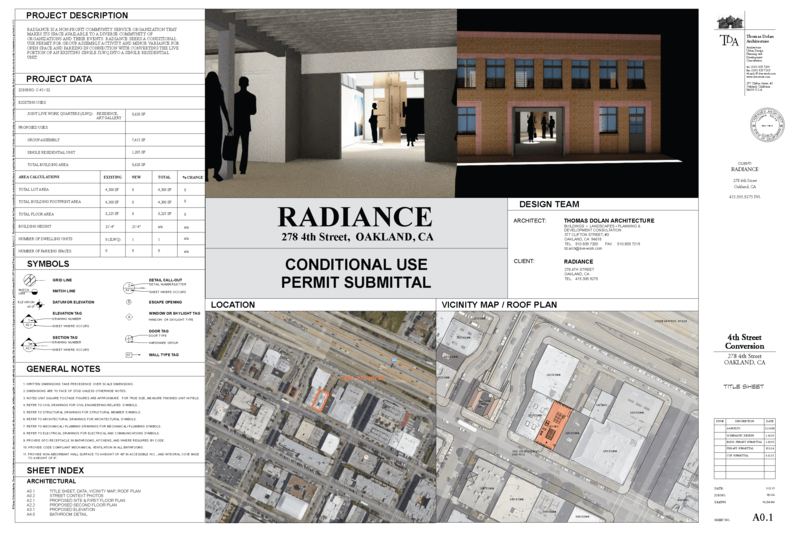 With the approval of the Group Assembly permit, 7,415 square feet (or 86%) will become Group Assembly event space with the balance remaining residential. There are two floors within Radiance. Throughout the building, seismic strengthening steel beams will be placed along the entire length of the interior walls. This seismic retrofitting cost requires the majority of the funds needed. Building codes require additional improvements to accommodate events up to 299 persons. The detailed plan for the ground floor is below. The center section of the ground floor will offer a lobby and exit area, event and art gallery space, and some storage in the rear separated by fire safe doors. The bottom third will bring much needed restrooms and facilities which adds 6 toilets, 5 hand washing sinks, 1 urinal and 2 drinking fountains. All restrooms are ADA compliant and able to accommodate wheelchairs. Additional storage is located in the back of this area. 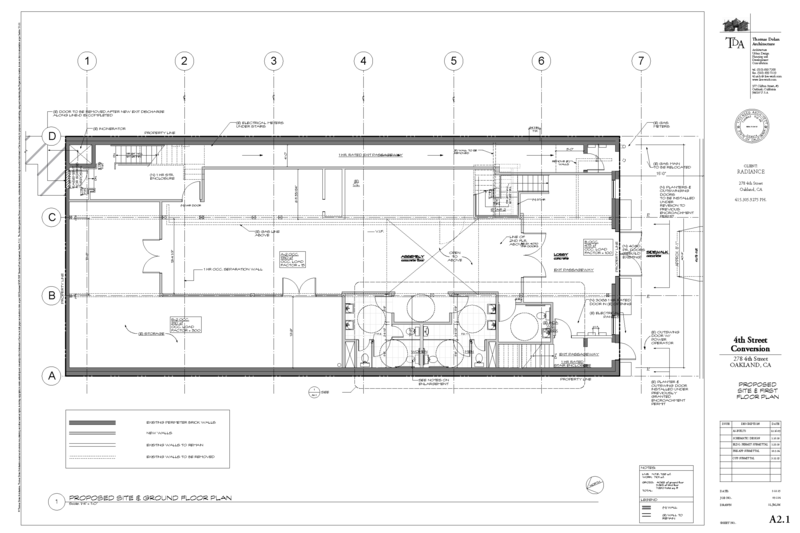 The plan for the second floor is shown below. In the top third, new stairs to the roof will be built. Access will be restricted by a locking door. The office space will be expanded with one section enclosed for privacy. All office spaces and access to one bedroom will be restricted by doors separating these private areas from the group assembly areas. Down the center of the second floor is the main event space with skylights throughout the roof. Near the front, the area will remain open from the skylights to the ground floor. This area is approximately 1,660 square feet of open space. The kitchen will remain largely untouched with the addition of enclosed walls and doors. The two upstairs bathrooms will also remain the same with 2 toilets, 1 urinal and 1 hand washing sink. The two other bedrooms will stay in place.